Maine Art Glass Studio is also home to the Sanctuary Gallery, featuring the scope of the Studio’s artists as well as more than 50 Maine artists working on a variety of mediums including stained glass, fused and blown glass, mosaics, pottery, jewelry, fabrics, sculpture and more. Commission services for art glass windows, door panels, transoms, sidelights, mirrors, cabinet doors, illuminated pieces and gift items are often a creative experience for the clients as well as the artist. We can offer an array of suggestions and styles and also interpret photos and designs brought to us by you, the commissioning customer. The first meeting between the customer and artist to establish what the art piece could look like costs nothing and puts the customer under no obligation. Once the proposal is prepared, the customer will see the proposed design in scale and will be quoted the exact price for the finished original art object. For most projects, a modest good faith deposit is requested to put the project on the Studio schedule. 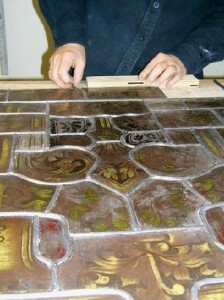 Restorations of stained glass are a studio specialty. Churches, chapels, synagogues, mausoleum, public buildings and businesses and private residences have all benefited from our repair and restoration services. Estimates are at no charge, through travel costs might be charged for estimates prepared for sites beyond the central Maine area. Repairs of stained glass bent panel lamps are another studio specialty. Many of the original glass manufacturers are still rolling the same glasses today as when your antique lampshade was first produced, making matching of glasses feasible. Appraisals for insurance purposes is another available service. A report can be prepared that gives trustees, administrators and building owner a firm idea of their assets worth. Signs and award plates are an attractive and imaginative approach to professional recognition. Framing services for antique or new construction window panels is a much sought after service provided by the Studio. Sand-blasting, etching and engraving on plate glass, flashed glass and mirror creates a powerful high contrast appearance that has a strong appeal. Commissioning short orders or mass production runs of a particular craft item is a great way to meet gift obligations, promote your business or show your appreciation to your chosen circle. The studio is also a teaching facility with stained glass supplies available and staff that has years of experience. See Schedule of Classes for more information on our art classes in Maine.